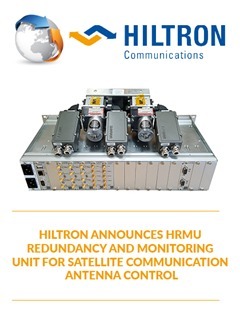 Stuttgart, Germany – Hiltron Communications announces a new addition to its satellite communications product range with the introduction of the Hiltron Redundancy and Monitoring Unit (HRMU). The HMRU is based on the proven design of the Hiltron HCS4 controller generation and is tailored to manage different control applications for commercial earth stations. The system is configurable to manage redundant groups of equipment such as low noise amplifiers, low noise block, and block upconverters. Its redundancy control function, including automatic switch-over to the standby/off-line units, is triggered by configurable thresholds for voltage, current and signal strength. Additional features offered by the HMRU include RF level detection, DC supply to LNBs and monitoring of L band signal strength with configurable thresholds. LNB control functions include voltage adjustment and 22 kHz tone generation in up to for bands for each polarity setting. Split unit operation can be employed for fibre-optic links, allowing separate L-band switching with monitoring of most of all commercially available fibre-optic converters. The HMRU can be operated via IP-based control, its graphical user interface being compatible with standard web browsers from any PC. An Ethernet interface is provided for monitoring and control via SNMP. Suitable for use over a temperature range of 0 to +50 degrees C (IP65 outdoor cabinet -20 to +50 degrees C) and humidity levels of 5 to 95 per cent non-condensing, the HMRU operates from 95 to 245 volts AC, 47 to 63 Hz, and consumes a maximum of 1 amp current at 230 volts. Maximum output power is 90/180 watts. The Hiltron Redundancy and Monitoring Unit will be introduced on the Hiltron stand, 5.B80, at IBC2018, Amsterdam, September 14-18. Hiltron Communications (www.hiltron.de) is a globally active system integrator, manufacturer and distributor in the field of satellite and wireless communication. The company operates from modern purpose-built headquarters at Backnang near Stuttgart. On-site facilities include a large technical operations area with high access doors and ceiling, capable of accommodating satellite-link vehicles and their roof-mounted antennas.